We live in a world and a city where it’s GO, GO, GO, and mental stimulation is constant. From Instagram-induced FOMO to Snapchat push notifications, there’s hardly ever any peace and quiet in our lives. Unless you specifically seek it out, that is. While meditation probably doesn’t need an introduction, we’ll give you a quick one: It’s a practice that can help us stay calm and centered in the midst of these crazy lives we all lead. To that end, we recommend you check out this list of 11 local studios — each of which offers at least one meditation class per week — to help give yourself a mental break while learning tactics to help manage stressful situations with ease. Whether you’re a meditation pro or a total newbie to centering yourself, you’ll find a class here for you. Classes offered: The Sanskrit word “Ah-him-sa” translates as nonviolence, and this organization views meditation as one of the best ways to put that tenet into practice. The center offers two main meditations: a silent session from 7:30 to 8:30 p.m. on Tuesdays and a guided meditation on Wednesdays from 5:15 to 6 p.m. Classes offered: One of Philly’s OG yoga studios, Dhyana Yoga doesn’t skimp on its meditation offerings. Free introductions to meditation take place on Saturdays and Sundays at noon, and studio owner John Vitarelli teaches a $5 breathing and meditation class at 11:15 a.m. on Tuesdays and Thursdays. Classes offered: As you can expect, this centrally located center has a bunch of meditation classes that follow the Kadampa Buddhist tradition. Don’t worry if you’re not well versed in Eastern practices, though; no experience is required for any of the sessions. Check out the Sunday morning and Thursday evening classes ($10 each) for two guided meditations and a lesson on a Buddhist tenet or the free Wednesday class at 8 a.m. to learn more about specific meditations outlined in Buddhist doctrine. Or check out the free talk on March 21 that discusses how to use meditation to deal with painful experiences. Classes offered: Juli Fussell‘s Mindful Elephant Yoga Studio is now closed (sad!). Some good news, though: The yoga and meditation teacher has partnered with Lumos to offer Mindful Flow and Meditation, a moderately paced class that connects breath and movement, on Fridays from 9:45 to 11 a.m. and Saturdays from 11:30 a.m. to noon. Classes offered: The Kundalini class at Mama’s is perfect if you’re looking for some movement with your meditation. Kundalini literally means energy, which you’ll be moving throughout your body with meditations and movements, inspired by breath. No yoga or meditation experience is necessary to take this Sunday evening class ($17 drop-in unless you have ClassPass or a multi-class card) from 5:45 to 7 p.m. Many of the workshops at Mama’s also incorporate meditation; check the schedule for details. Classes offered: Tuesdays are for transcending at Palo Santo — from 5:15 to 6:15 p.m. every Tuesday evening, the studio hosts a donation-based meditation and mantra session. Expect a 30-minute guided meditation session focusing on breathwork and mantra chanting. The studio also incorporates meditation into several of its yoga offerings. Bonus: On April 5th and 6th, Palo Santo will host Madhu, a former monk and traveling meditation teacher for an immersive introduction to meditation. The workshop ($108) will cover styles ranging from seated meditation to mantra chanting and end with a “Kirtan,” a group singing and chanting performance. Classes offered: In addition to the many meditation retreats and meditation teacher trainings gracing Raja’s calendar, the schedule features two weekly Hatha yoga classes with seated meditations on Saturday mornings from 9:30 to 11 a.m. and Sundays from 11:30 a.m. to 1 p.m. You can expect the yoga practices to be shortened, leaving ample room for 20 minutes of meditation and a short debrief. 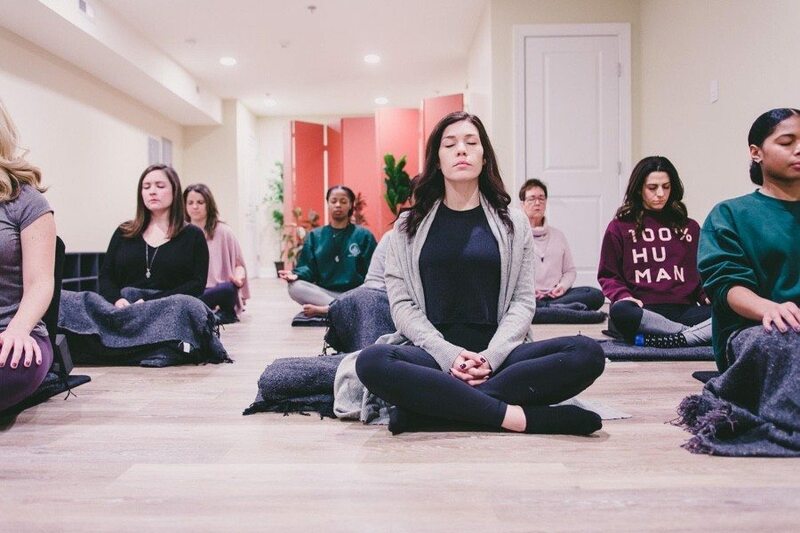 Classes offered: Sanctuary Yoga’s schedule features “Mindfulness Meditation,” a 30-minute guided meditation utilizing yogic and mindfulness techniques every day of the week (and sometimes twice or three times a day!). This session is open to everyone, whether you’re a meditation pro or just someone looking for a few peaceful moments. Classes offered: calendarJoin this local chapter following Shambhala Buddhist teachings for free (although donations are welcome) public meditations from 6 to 7 p.m. Tuesday through Thursday and from 9 a.m. to noon on Sundays. Check the for a full list of introductory programs if you’re interested in more of a guided experience. Classes offered: Thrice weekly, the Sanctuary hosts a 30-minute breathing and meditation class. The session will teach you breathing and meditation techniques that will aid in mental clarity, stress reduction, and mental strength — all for free. And, later this month, you’ll be able to live stream the classes on YouTube and the Sanctuary’s website, so there’s no excuse not to try out the mindfulness techniques. Classes offered: If you’re looking for an intense experience, head to this center affiliated with the Ordinary Mind Zen School. The group meets Sundays from 10 a.m. to noon for three series of meditations, a talk, and private interviews with the teacher. Wednesdays are similar except only two meditations take place. (Both days are donation-based.) The organization also holds all-day meditations ($20 to $25) on the fourth Sunday of every month.